The most important systematic medieval Persian medical encyclopedia was that composed by Ismā‘īl ibn al-Ḥusayn al-Jurjānī, written after he moved in 1110/504, when seventy lunar years old, to Khvarazm, a northern province of Persia, just south of the Aral Sea and including parts of present-day Uzbekistan and Turkmanistan. There he became court physician to the governor, for which reason he gave the encyclopedia the title The Treasure of Khvārazm’Shāhī because it was dedicated to the then governor (Khvārazm’Shāhī) Qutb al-Dīn Muḥammad ibn Nushtigin, who ruled from 1097 to 1127 (490-521 H). His Treasure of Khvārazm’Shāhī is greatly dependent upon the Canon of Medicine of Ibn Sīnā (Avicenna), but still displays a great breadth of learning and incoporates ideas not to be found in the Canon. The Zakhīrah (Treasure) is composed of ten books (kitabs): the first two concern anatomy and physiology, the 3rd is on hygiene, the 4th on diagnosis and prognosis, the 5th on fevers, the 6th on diseases particular to a part of the body, the 7th on surgery, the 8th on skin diseases, the 9th on poisons and antidotes, and the 10th on medicaments, both simple and compound. The last book, the 10th, sometimes circulated as a separate treatise under the title Kitāb-i Qarabadhin or Kitāb-i Aqrabadhin (The Formulary). For a more detailed outline of the contents, see the article "Dakira-ye KvarazmShahī" by ‘Ali-Akbaar Sa‘idi Sirjani in EncIr, vol. 6 (1999) pp. 609-610. 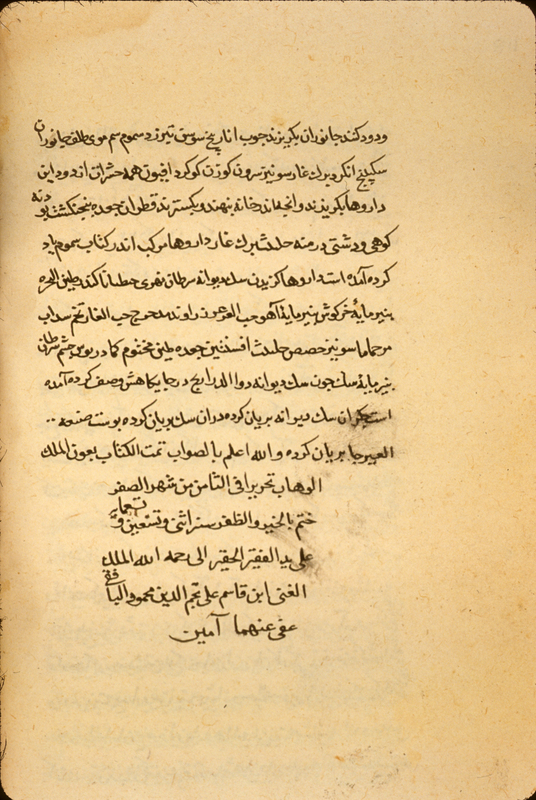 Jurjani made his own translation of his Persian treatise Zakhirah-Khvarazm’Shahī into Arabic. Hebrew and Turkish translations made later, and in Lucknow (in present-day Pakistan) in 1878 an Urdu translation was published as a lithographed text. Jurjānī also composed an abridgement of the Zakhirah, which he titled Jam‘-i Zakhīrah-i Khvarazm’Shahī or "Selections from the Treasure of Khvarazm’Shah". This shorter version was written for ‘Ala' al-Din Atsiz, the son and successor of Khvarazm’Shah Qutb al-Dīn Muḥammad. The second discourse of the 6th Book of the Zakhīrah-i Khvarazm’Shahī, concerned with diseases of the eye, has been translated into French and studied by B. Thierry de Crussol des Epesse, Discours sur l'oeil d'Esma'il Gorgani (Teheran: Institut Français de Recherche en Iran, 1998). For other manuscript copies, see Richter-Bernburg, "UCLA", pp. 2-14; Keshavartz, "Wellcome", pp. 149-154; Storey PL II,2, pp. 207-209; Ullmann, Medizin, p. 161; and Catalogue of Islamic Medical Manuscripts (in Arabic, Turkish, and Persian) in the Libraries of Turkey, ed. Ekmeleddin Ihsanoglu (Istanbul: Research Centre of Islamic History, Art and Culture, 1984), pp. 179-181; and F. Maddison and E. Savage-Smith, Science, Tools & Magic (London/Oxford: Azimuth Editions and Oxford University Press, 1997), vol. 1, p.36 no. 9. A facsimile of a copy now in Tehran that was copied in 603 [= 1206] was edited and published by ‘Ali-Akbar Sa‘idi Sirjani in Tehran in 1976 (Intisharat-i Bunyad-i farhang-i Iran, 249, ‘Ilm dar Iran, 20). The next earliest is a copy begun in the year 664 [= 1266] and now in Patna; see the Catalogue of the Arabic and Persian Manuscripts in the Oriental Public Library at Bankipore, vol. 12 (Patna: Government Printing, Bihar, 1927), pp. 3-7. An important copy completed on 14 Jumada II 671 [8 January 1273] was in the private collection of Maulvi Muhammad Shafi' in Lahore, Pakistan (see Arif NauShahī, "Some Primary Sources of Persian Medical Manuscripts in Pakistan and India," in La science dans le monde iranien, ed. by Z. Vesel, H. Beikbaghband B. Thierry de Crussol des Epesse [Bibliothèque Iranieene, 50] (Tehran: Institut Francais de Recherche en Iran, 1998), pp. 291-295, esp. p. 294; it was offered for sale in London on 14 October 1999 (Sotheby's sale catalogue, lot 21). The first book of the Zakhīrah-i Khvarazm’Shahī has been edited and published by Muhammad Taqi Danish-Puzhuh and Irag Afshar (Intisharat-Danishgah-i Tihran, 1002) in Tehran in 1965. The second and third books were edited by Jalal Mustafawi and published in Tehran in 1971 and 1973 (Silsilah-i intisharat-i Anjuman-i athar-i milli, 76 and 97). The colophon of a copy of The Treasure of Khvarazm’Shah by Jurjānī where it states that the copy was completed on 22 Dhu al-Hijjah 1089 [=17 August 1679] by a scribe named Muḥammad Mu’min ibn Shams al-Dīn ‘Alī (with the last part of the name, the nisbah, not legible. In the margin there is a geomantic tableau added by a later reader for use in divination by a method known in Arabic as ‘ilm al-raml (the art of the sand) and in English as 'geomancy'. There is also an owner's note dated 1111 [= 1699]. Persian. 346 leaves (fols. 1b-88b, 90a-246b, 248a-348b). Dimensions 37.2 x 32.3; text 30.8 x 14.8 cm; 30-31 lines per page. The title is given on folio 1b, line 11, and in the colophon, fol. 348b, line 22. The author's named is given on folio 1b, line 24, as: Isma‘il ibn al-Hasan al-[? ], with the last part of the name illegible. The dedication to Qutb al-Dīn Muḥammad Anushtagin Khvarazm’Shah is found on folio 1b, line 4. At the end of the treatise, the colophon on fol. 348b states that the copy was completed on 22 Dhu al-Hijjah 1089 [=17 August 1679] by Muḥammad Mu’min ibn Shams al-Dīn ‘Alī, with the last part of the name, the nisbah, not legible. At the end of the second book (fol. 64b, line 24), however, the copy is dated the month of Sha‘ban 1092 [= August-September 1681]. The copy is not entirely complete. Breaks occur between fols. 9/10, 177/178, 182/183, 234/235, 288/289, and 321/322. Fols. 129-137 have been bound upside down, so that the correct sequence should be fols. 128, 137-129, 138, etc. The text is written for the most part in a small ta‘liq tending to naskh script. Black ink with headings in red and some marginal headings. There are catchwords. There are several different hands evident in the copying of this manuscript; a particularly obvious change of hands occurs between fol. 210 and 211. There are marginalia in several hands, and the copy has been collated (collation notes occur, for example, on folio 248a). At the end of the treatise, on folio 348b, a reader has written a geomantic tableau as part of the practice of divination called in English 'geomancy' (Arabic, ‘ilm al-raml). The thin, beige, glossy paper has wavy horizontal laid lines and no chain lines. The paper is badly waterstained, especially toward the bottom, and heavily soiled with grime. The edges have been trimmed from their original size. Some leaves have been repaired, with later marginalia added to the newer paper. The volume consists of 348 leaves. Fol. 89 (on beverages) and 247 (on barleywater) do not belong with the main treatise. They are written on different papers and by different hands from the rest of the volume. Folio 89 is in a casual nasta‘liq script on watermarked paper, while folio 247 is in a carefully written naskh script on a very thin paper having only laid lines. A loose leaf with anatomical figures on it was found by Sommer between fol. 246 and 247 (Schullian/Sommer, Cat. of incun. & MSS., p. 331); this sheet has now been catalogued as MS P 5 fol. A, and will be described below in the section on anatomy. Two loose leaves were also found between fol. 212 and 213; both are on modern paper and contain Persian notes apparently unrelated to the rest of the manuscript; one has owners' stamps and several dates occuring in the years 1308 and 1309 [= 1890-1892]; these two leaves have now been placed in a separate envelope and labeled: MS P 5, fol. B and C.
The volume is bound in a modern leather binding incorporating two badly deteriorated covers from an earlier binding of dark-red leather over pasteboards. On each cover there are blind stamped and tooled designs in the center and at each corner; these designs were at one time covered with paper. There are modern pastedowns and endpapers. The front endpaper has four pieces of paper (apparently cut out from earlier endpapers) pasted on it; these bear various pious statements and jottings, including one noting the birth of a child named Muḥammad Ibrāhīm on the 2nd of Safar 1235 [= 20 November 1819]. On fol. 348b there is an owner's note dated 1111 [= 1699]. Fol. 1a has a number of owners' stamps and signatures, some defaced; they include some dated 1200 [= 1785-6], 1229 [= 1814], and 1230 [= 1815]. There are additional owners' stamps on fol. 31b and 35a. On the front endpaper there is a piece of paper (perhaps cut out from an earlier endpaper) pasted on it that has a notation of the birth of a child named Muḥammad Ibrāhīm on the 2nd of Safar 1235 [= 20 November 1819]. The volume has been in the collection of the Army Medical Library as of 1946. No additional information is available on its provenance. Schullian/Sommer, Cat. of incun. & MSS., p. 331, entry P5. The colophon to a copy of the final book of The Treasure of Khvarazm’Shah by Jurjani. It states that the copying of the first section (on materia medica) was completed on 8 Safar 992 [= 20 February 1584] by Qasim ‘Ali Tajm al-Din Mahmud al-Yafaqi. Persian. 140 leaves (fol. 1b-61b, 66b-144a). Dimensions 17.2 x 11.5; text area 12.5 x 6.8 cm; 14-20 lines per page. The title given in the colophon at the end of the first section (fol. 61b) translates as: "The formulary from the final book of Zakhīrah-i Khvarazm’Shahī". At the beginning of the text (fol. 1b, line 3) the title is given as Kitāb-i Aqrabadhin (The Formulary). The author is not named in this copy, but the text corresponds to that found on fols. 296b-346b in the previous manuscript (NLM MS P 5), which is a complete copy of the encyclopedia. 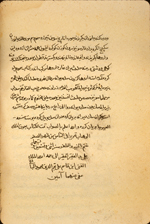 The manuscript contains only the final book of Zakhīrah-i Khvarazm’Shahī, that which is on simple and compound remedies, in two sections (guftars). Although the colophon giving the copyist's name and date occurs at the end of the first section (fol. 61b) of the book, the manuscript does contain a complete copy of the tenth and final book of Zakhīrah-i Khvarazm’Shahī. In the colophon to the first section (fol. 61b) it states that the copying of that section of the pharmacopeia was completed on 8 Safar 992 [= 20 February 1584] by Qāsim ‘Alī Tajm al-Dīn Maḥmūd al-Yāfaqī. The text is written in a small, compact, and careful naskh script. The text area has been frame-ruled. Black ink with headings in red. There are catchwords. There are some marginal corrections by the scribe, and occasional later marginalia. Fol. 135-144 are later replacements, copied in a more recent nasta‘liq script on different paper; the text area was not frame-ruled, but had the edges of text area indicated by vertical fold lines. Fol. 135-144 probably replaced the damaged final folio of the original copy. The beige, glossy paper of fols. 1-61 and 66-134 has wavy laid lines only, and no chain lines. The paper of fols. 135-144 is dyed gray-green and has wavy laid lines, single chain lines, and watermarks (an Eastern watermarked paper ?). The paper throughout is dampstained and waterstained at the top and soiled with grime and thumbing. The edges have been trimmed from their original size. The volume consists of 144 leaves. Fols. 62-66a are blank. Fol. 1a is blank except for defaced owner's notes and penciled catalogue notes; fol. 144b is blank but for an owner's note and a penciled notation of purchase price. The volume is bound in pasteboards covered with brown leather. The pastedowns are of dark-brown (watermarked) paper; there are no endpapers. Owners' notes occur on fols. 1a (defaced) and 144b. No names or dates can be detected. The volume was in the collection of the Army Medical Library as of 1946. No further information is available on its provenance. Schullian/Sommer, Cat. of incun. & MSS, p. 335, entry P14. Persian. 1 leaf (fol. 1b). Dimensions 22 x 13.2; text area 11.5 x 8.5 cm; 12 lines. The title is given on fol. 1b, line 7, as: Jam‘-i Zakhīrah-i Khvarazm’Shahī. The author is named in the previous line as: Ismā‘īl ibn Muḥammad al-Ḥusayn al-Jurjānī. Only the opening leaf is preserved in this copy. Fol. 1a is blank. The leaf is unrelated to the rest of the volume, and written on different paper and by a different hand. The fragment is undated. It is written in a medium-small, compact nasta‘liq script. The text area has been frame-ruled. Black ink with headings in red. There are no catchwords, but the edges have been badly damaged and repaired, so that it is likely that the catchword is now missing. The paper has horizontal laid lines but no chain lines, and is different from that used elsewhere in the volume. The edges have been damaged and repaired. The leaf is guarded. The volume consists of 162 leaves and one preliminary folio. The preliminary folio and folio 1a are blank. The volume contains a collection of 8 metrical treatises on medical topics in addition to a fragment of an encyclopaedia. Item 1 (fol. 1b) is a fragment of an abridgement of an encyclopaedia by Jurjānī here catalogued; item 2 (fols. 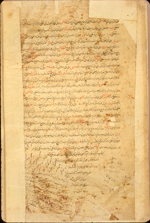 2a-80a) is the poem by ‘Alī ibn shaykh Muḥammad ibn ‘Abd al-Raḥmān (MS P 25, item 2); item 3 (fols. 80b-95a) a poem possibly based on a treatise by Jurjānī (MS P 25, item 3); item 4 (fols. 95a-98b) anon. poem on cure in a hour possibly based on a treatise by Rāzī (MS P 25, item 4); item 5 (fols. 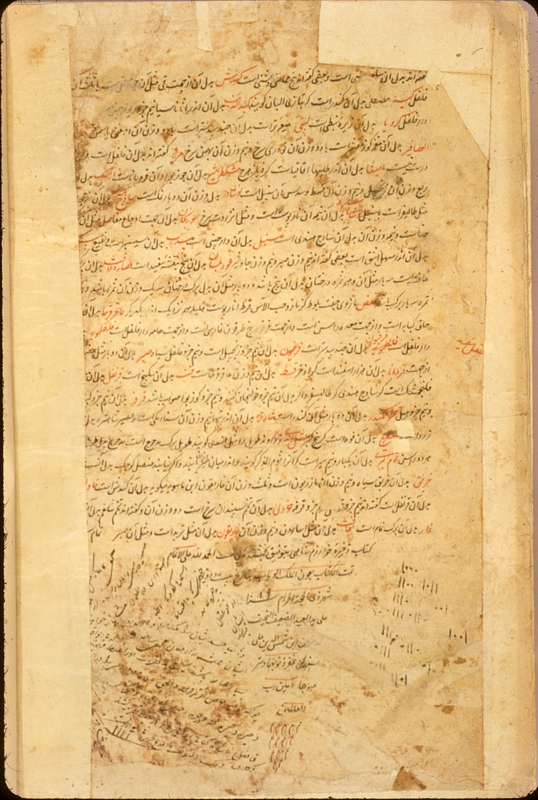 99a-117a) versification of a treatise by Jaghmīnī (MS P 25, item 5); item 6 (fols. 117b-118a) anon. poem on leprosy (MS P 25, item 6); item 7 (fols. 118b-156b) anonymous Turkish poem with Persian commentary (MS P 25, item 7); item 8 (fols. 157b-160b) anon. poem on regimen and therapy (MS P 25, item 8); item 9 (fols. 161a-162a) anon. poem on materia medica (MS P 25, item 9). The marginal item (MS P 25, margin) occuring on fols. 2a-159a and 160a-162b is an anonymous prose treatise on materia medica and regimen. There are occasional unexplained blank central spaces on leaves where the marginal treatise continues around the edges of the folios. In two of these central blank spaces (fols. 75a and 76a) a much more recent and casual hand has placed two 16x16 magic squares. The order of the leaves comprising the volume may not be entirely correct. The volume is bound in a modern library binding of pasteboards covered with tan leather, with "Khamrah Agha, Jawahir al-maqal 1796" in gilt on the spine. There are modern pastedowns and endpapers. At five places in the volume (fols. 75a, 76a, 95a, 98b, and 162b) a later hand in a good calligraphic script has repeated the same statement: "The owner and possessor of this medical book called Jawahir al-maqal is Khamrah Aghā ibn Rustum ibn Muḥammad Aghā ibn Khiḍr Aghā ibn Mīr Khamrah ibn Mīr Mīzā ibn Aḥmad Beg, in the year 1211 [= 1796-7]." An owner's stamp accompanies these statements. Schullian/Sommer, Cat. of incun. & MSS., p. 338, interpreted this name as referring to the compiler of the collection, giving the name as Khamrah Aghā ibn Rustam Aghā ibn Muḥammad; the name, however, is clearly that of a later owner. The volume was bought in 1941 by the Army Medical Library from A.S. Yahuda, who acquired it in Ebril in northern Iraq (ELS 1685 med 45). Schullian/Sommer, p. 338 entry P25, where the name of an owner of the volume is misinterpreted as the compiler of the collection.